[Read more…] about We can learn from each other! I have been thinking how better to introduce the members of the Church to the issues surrounding church history and Masonry. One of the biggest issues here is that most Latter-days Saints know next to nothing about the subject and neither do their leaders. FAIR has announced the dates for the 2008 FAIR Conference. It will be held August 7th and 8th at South Towne Expo Center in Sandy, Utah. Additional information, as it becomes available, will be on the FAIR Conference page. Arriving late at a venue whose existence I was unaware of until just a week ago, I joined a standing room only crowd to listen to the pioneering Book of Mormon archaeologist speak. The atmosphere at the Olivewood bookstore in Provo was electrifying for a student of all things FARMS like myself. There was nary a saccharine, fluff-filled book to be found on any of the shelves, in contrast to the typical fare offered at Deseret Book. Art depicting scenes from the Restoration riddled the walls and was a welcomed relief to the poor quality stuff I have been subjected to from a recently publicized antagonistic website. What caught my attention most was the very enticing Neil A. Maxwell Institute reading room. It appears that “Finn” may become the GOP nominee for vice president of the USA. Such a ticket, though, would lose to the Democratic nominees–big. To some Evangelicals, those “bigoted Mormons” would be the scapegoats, since they don’t see “Finn’s” anti-Mormon cracks as the reason for the lack of LDS enthusiasm. Moreover, I imagine that these and other Evangelicals would see this loss as yet another instance of being persecuted. Unlike militant Evangelicals who claim that Latter-day Saints lie about being persecuted, I categorically affirm that Evangelicals are also victims of persecution. As Glenn Beck might put it, “Here’s how I got there:” [Read more…] about Biases everywhere…. Recently Menachem Wecker contacted FAIR, at the referral of the Church’s PR department, for a reaction to a blog that has re-envisioned scenes from Church history through a critical lens. A lens that focuses on the sensational and weird under the self-justifying guise of correcting mistakes that have cropped up in Church published art. Scott Gordon, myself, and others provided Wecker with our individual takes on the revisionist blog’s artwork. Greg Smith created an illustrated wiki article that combined the contributions of FAIR members and his own to treat the subject with much more clarity than my own response to Wecker**, a portion of which is included below. 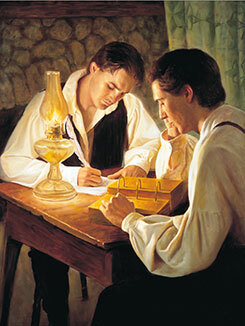 First let me note that Blake Ostler and I (more Blake than me) addressed this topic on the Mormon Stories blog as well. **Update 2/26/’08: See Greg Smith’s comment below. My original wording is in error. Greg had already had most of his article independently conceived/written to respond to general art-based criticism levied much before being aware of the art blog in Wecker’s article. Heretic that I am, I regularly read the Skeptic and the Skeptical Inquirer (2 magazines that regularly attempt to debunk anything that seems to be unscientific). Although I don’t agree with everything in their magazines (much of it is atheistic), I do like a lot of what they print. The other day I picked up the latest copy of the Skeptical Inquirer and found that the first article I read tied neatly into LDS apologetic efforts. The article is entitled “Difficulty in Debunking Myths Rooted in the Way the Mind Works,” by Shankar Vedantam. Here are some quotes, paraphrases, and summaries of the article.